The Dividist Papers: Sequestration is not the problem. Sequestration is (part of) the solution. Sequestration is not the problem. Sequestration is (part of) the solution. The steady drumbeat in the mainstream media about the sequestration "crisis" is getting louder by the day. With less than two weeks until the cuts go into effect it is already approaching an absurdist crescendo. Let's be clear. The "sequester" is not a crisis. The "sequester" is not the problem. The real problem is the massive growth in federal spending creating unsustainable deficits and debt that will be shouldered by generations to come. The "sequester" is a solution to a real problem facing America. 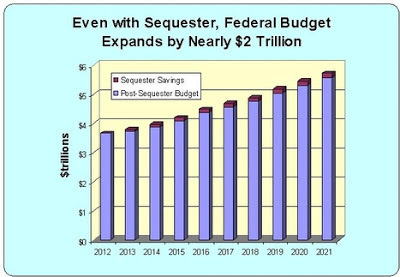 That said, the "sequester" is not a great solution. It's not even a good solution. 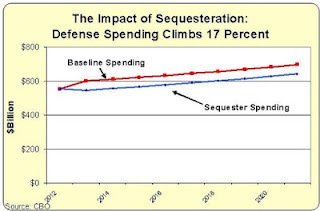 The sequester cuts are not a smart way to address the spending problem. The sequester cuts are also not adequate to solve the spending and unfunded liability disaster that looms in our entitlement programs. But the odds of getting anything smart out of this administration or this congress that even makes as little impact on the real problem as do the sequester cuts are vanishingly small. Since it's a bad bet to rely on our leaders for smart significant cuts, let's at least take the cuts they already passed. This is what "gutting" the defense budget looks like. The across-the-board sequestered spending cuts that go into effect March 1st were proposed by President Obama, passed with a bipartisan majority in both the House and Senate, and signed into law by President Obama. The president even threatened to veto any changes to the sequester. The hypocrisy of the principal architects of the legislation from both parties trying to undo it now borders on farce. "Pelosi also on Thursday became the latest leader to say that she will oppose any efforts by members to undo the $1.2 trillion across-the-board spending cut that will go into effect in 2013 if the supercommittee fails.“The sequester is what it is,” Pelosi said. "Well, I think that the sequestration is a bad idea, all around. It is something that is out of the question. The fact is, we have had plenty of spending cuts..."
The Dividist says F*ck 'em. They passed it. If we can't get the cuts we love, love the cuts we've got. The Dividist is not alone in that assessment. "We should let it happen," Dean said of $1 trillion in domestic, defense and Medicare spending cuts set to be triggered on March 1. "I’m in favor of the sequester. It is tough on things that I care about a lot, but the fact of the matter is, you are not going to get another chance to cut the defense budget in the way that it needs to be cut." "Sequestration likely won’t be as bad as special interests and those in favor of ever-increasing military spending claim. The reductions would only apply to FY 2013 budget authority, not outlays. The Pentagon and Congress will then have greater flexibility starting in FY 2014 to adjust the reductions under the BCA spending caps. In the meantime, many programs could continue on funding already authorized. We must also keep the cuts in proper perspective. The DoD base budget under sequestration would total $469 billion, about what we spent in 2006, which was not exactly a lean year for the Pentagon. And as for the claim that the military cuts will result in perhaps one million lost jobs, that seems implausible considering that the cuts would amount to less than three tenths of one percent of GDP." If they do nothing, the $1.2 trillion in cuts go into effect. This is the one time Republicans can get cuts under an administration that has no intent of cutting anything. Get them while you can. Of course, the sequester is terrible policy. The domestic cuts will be crude and the Pentagon cuts damaging. This is why the Republican House has twice passed bills offering more rationally allocated cuts. (They curb, for example, entitlement spending as well.) Naturally, the Democratic Senate, which hasn’t passed a budget since before the iPad, has done nothing. Nor has the president — until his Tuesday plea. "We need the reduction," Cote said. "You could argue that the reduction would make more sense if we did it thoughtfully and spent a lot of time on it. I'm not sure that's a real option, though. The options seem to be let it happen or take it away." Cote remains a leading voice in the corporate "Fix the Debt" group, which spent months last year lobbying the Democratic White House and Republican lawmakers to reach a deal to reduce the national debt and avoid a year-end "fiscal cliff." of spending cuts and tax increases. Having seen that deadline quickly replaced by the March 1 sequester deadline, Cote said that allowing the cuts previously agreed to take place may be the most practical way to start trimming the debt." "The most likely way to achieve significant reductions in spending is by across-the-board cuts. Each reduction of 1% in the $3.6 trillion federal budget would yield roughly $36 billion the first year and would reduce the budget baseline in future years. Even with modest reductions, this is real money. …let’s give up the politically pointless effort to pick and choose among programs, accept the political reality of current allocations, and reduce everything proportionately. No one program would be very much disadvantaged. In many cases, a 1% or 3% reduction would scarcely be noticed. Are we really to believe that a government that spent $2.7 trillion five years ago couldn't survive a 3% cut that would bring spending to “only” $3.5 trillion today? Every household, company and nonprofit organization across America can do this, as can state and local governments. So could Washington." "As I said, cuts would hurt, and not just for those of us in the Federal government. It’s a horrible time to cut spending, given that the economy is finally just getting back on its feet. Economists have stated the sequester would likely reduce GDP by a full percentage point for the next few quarters. But the pragmatic side of me states that across-the-board spending cuts would force agencies to streamline, which isn’t necessarily a bad thing. The pragmatic side of me says a short-term hit to the economy is worth it, IF it gets the U.S. to take a more realistic look at our military spending. Sequester? Just let it happen." "This sequester is a political test for those of us who want to cut the size and scope of government. Here we have $1.2 trillion in automatic cuts set to take place. All Congress has to do is nothing for them to happen. If we can’t get Congress to do nothing and let $1.2 trillion in cuts take place, how are we going to pass the deeper spending cuts and entitlement reforms we need to rescue our country from financial ruin? Finally, here is a chance to take on the sacred cow that is defense spending. If we cannot make these modest defense spending reductions, how are we going to take the hard look at our foreign policy that we desperately need? This is one time where Congress can help the country by doing nothing. They should not act and let the sequester happen as a small first step to getting the nation’s financial house in order." Let's start fixing the real problem. Take the bird in the hand. Let the sequester go into effect. Politically the sequester evens the score. Democrats got some tax increases in December. Republicans get some spending cuts now. The stage is set yet again for another run at a "Grand Bargain". Both tax and entitlement reform will be on the table while negotiating the Continuing Resolution and Budget in March. Perhaps our last best chance in this administration to solve the problem. Fixed typos and added relevant links after Obama uppercut and Boehner haymaker and the new Simpson-Bowles plan. Good Luck with the blog. I hope you enjoy your pontifications as much as I do here. FB "Liked" and added you to the sidebar blogroll. Since you are soliciting contributions, I may cross-post some on your blog. 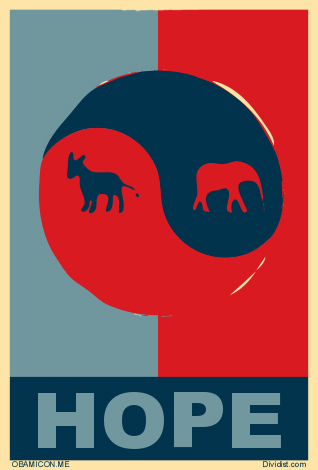 Full disclosure: While I am generally sympathetic to Centrist views, the feeling is not always mutual. Not all moderate appreciate my perspective on achieving dynamic centrist outcomes through the mechanism of extreme dividism. I hope you're happy. Sequestration is what we get when we have bipartisanship and divided government. Well Yeah. I think my post makes my feelings about the sequester perfectly clear. I am delighted that the "cuts" went into effect. Obviously they are not enough to solve our debt problem, but at least we have have taken one baby step back from the brink.